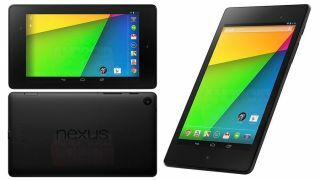 The leaks just keep on coming: A new cavalcade of Nexus 7 2 images have arrived with a fresh wallpaper, suggesting Android 4.3 rumors may indeed be true. Android Police today posted a basket of images purporting to show the next Nexus 7 from all angles, including a peek at a new wallpaper that could very well be the default Android 4.3 background. In addition to the 1.5GHz quad-core processor with dual cameras reported last Friday, the Nexus 7 2 is now said to include a notification LED as well as a 1920 x 1200 display resolution. Google is hosting an event Wednesday during which it's widely believed it will unveil Android 4.3 as well as the new Nexus. Reports have pegged a 32GB model for $269 (about £175, AU$291), and a less expensive 16GB model at $229 (about £149, AU$247). Perhaps the more interesting aspect of the newly leaked images are the inclusion of an all-new wallpaper on every single front-facing, suggesting that the 7-inch tablet will indeed come sporting an updated Android 4.3. Further supporting this rumor is the time of day featured on the latest screenshots, which shows 4:30 - as in "Android 4.3"...see what we're saying? As we've seen in other leaks, the Nexus branding on the back appears to be in landscape mode instead of portrait, in keeping with the tradition established on the Nexus 10, although the Nexus 7 2 is will be manufactured by Asus again. At this point, the only "surprise" left may be any wireless data connectivity, such as 4G LTE - but you may have to wait until Google's event on Wednesday to find out. Check out our hands on review of the swanky soon to be released Sony Xperia Z Ultra.